A LED is blinking on my device. What does it mean? MoveMonitor(+) the device is blinking for 10 sec directly after disconnecting the device when a measurement is programmed to start in the future. The first 5 minutes of the actual measurement the device will also blink. Green LED is shining continuously while connected via USB: The battery of the device is fully loaded. Red LED blinking: Battery is low. Blue blinking LED: Bluetooth is active and the device is detectable for the computer. Blue LED is shining continuously: There is an active Bluetooth connection between the device and the computer. Blue LED is shining continuously and Green LED is blinking: The MT device is measuring. Blue and green LED’s are shining continuously: there is an internal error. Please contact the Supportteam. Please mention the device ID. Are the MM, MM+ and MT waterproof? The devices are not waterproof. Please avoid wearing the device during water activities like showering, bathing or swimming. Dampness due to sweating or rain is no problem. While entering subject date of birth on MyMcRoberts, I am only able to enter year of birth. Is this a problem? This does not result in problems. Because of privacy-reasons you can only fill in the year of birth. The analysis software only uses the year of birth for calculation of parameters. How do I update my device to the latest firmware version? MyMcRoberts will automatically inform you on firmware updates. Click here to update you’re device to the latest firmware version. I think my device is malfunctioning. How do I proceed? If your device is malfunctioning, you can try repairing your device through the following link. If this doesn’t solve the problem, please contact the support team. Where can I find scientific publications and validations on McRoberts’ products? McRoberts’ products are extensively validated and utilized in research projects. An extensive and convenient overview on scientific publications can be found here. Where can I find brochures on McRoberts’ products? Feel free to send an email if you require additional info. While signing-up a ‘study code’ is required. What should I enter? The study code should be provided by McRoberts. Please contact support@mcroberts to request a study code. Start and End time of a measurement in MyMcRoberts indicate ‘Invalid Date’. Please contact the supportteam to check the measurement. Make sure u provide the username and measurement ID. Why is my measurement in “idle measurement”? There are two possible reasons for a measurement going in Idle. A measurement will go Idle if you don’t have the appropriate licenses for the reports. If you do have the appropriate licenses and the measurement still goes Idle, it is an analysis error. If this happens, please contact the supportteam to re-request the analysis. 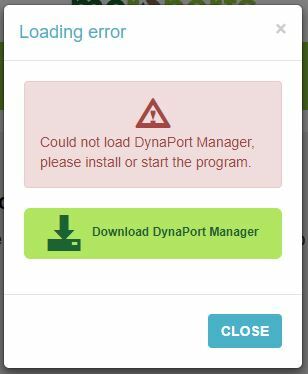 If you keep getting the error “Could not load DynaPort Manager, please install or start the program” while you installed the DynaPort Manager, it means the DynaPort Manager isn’t running or the certificates of the browser aren’t set up correctly. 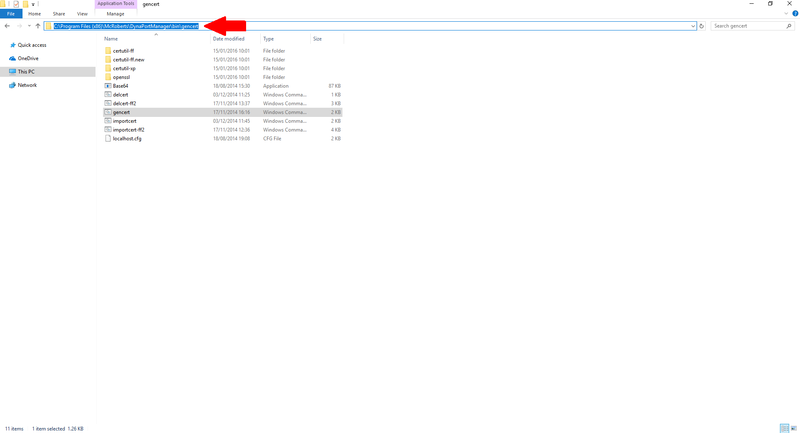 in the address bar of the File Explorer and right-mouse-click on “Run” and click on “Run as Administrator”. Close all the active browsers. Close the DynaPort Manager in the Task-manager (ctrl+shift+esc). Click on the program Network (32 bit) and end this task. in the address bar and run “Gencert.cmd” as administrator (right-mouse-click “Run as Administrator”). Start the DynaPort Manager as described above and open MyMcRoberts in your browser. Connect a device. 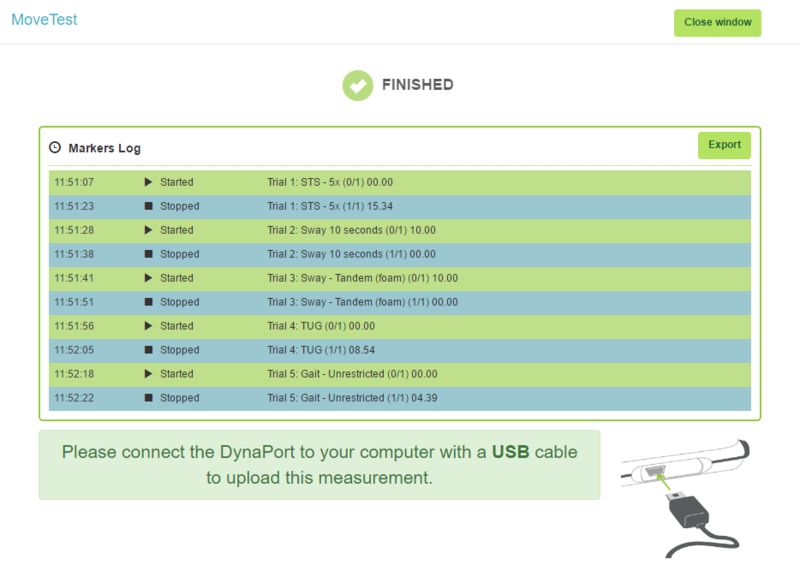 The DynaPort Manager is working if the device is visible. If you are still getting the loading error in MyMcRoberts, please contact the supportteam. An error occurs while downloading data stored on the device to the PC. In that case the path to which the measurement is transferred often doesn’t exist. 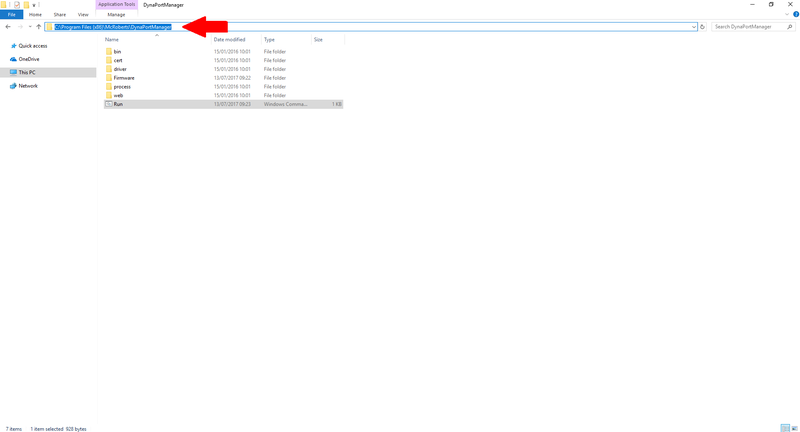 The current path used for transferring data can be seen by going to C:\Program Files (x86)\McRoberts\DynaPortManager. Left klick on the file ‘Run’ and choose edit. The store path is shown and can be altered here. Make a screenshot and send it to the supportteam. You can also try to upload the measurement manually. How do I upload a measurement that is stored on my pc? If you want to upload a measurement that is stored on your pc you can click here. Contact McRoberts if it is stated that the measurement has already been uploaded. How do I change subject characteristics (weight, height, gender, date of birth) of existing subjects? Once characteristics have been entered they can’t be altered by the user to prevent unwanted changes from occurring. Send an email to McRoberts and McRoberts’ personnel will do it for you. Please include the username, the project, the subject and the values you want to be changed. Which browser is recommended for the use of MyMcRoberts? McRoberts recommends to use Chrome or Firefox. Make sure your browser is up-to-date. Regarding the use of the MoveTest we advise against Internet Explorer. What is the maximum measurement duration of the MoveMonitor? The Maximum measurement duration of the MoveMonitor is 14 days. The maximum measurement duration of the MoveMonitor+ is 7 days. The MoveMonitor+ hardware includes an additional tri-axial gyroscope whereas the MoveMonitor hardware does not. The gyroscope’s sampling frequency is 100 Hz. The MoveMonitor has a maximum measurement time of 14 consecutive days. The maximum measurement time of the MoveMonitor+ is 7 consecutive days due to extra data storage and energy expenditure resulting from the addition of the gyroscope sensor. Is it possible to program a measurement to start in the future? A MoveMonitor measurement can be programmed to either start direct or to start in the future. In the measurement tab in MyMcRoberts you can select the day and time at which the measurement should start. The serial/ID number in MyMcroberts doesn’t correspond with the serial number on the the back of the device. What can I do? Contact mcroberts including the serial number as shown in MyMcRoberts and the serial number on the back of the device. The PC is unable to detect the MoveTest device for establishing a Bluetooth connection. Flip the device in order to activate the Bluetooth module. Bluetooth consumes relatively large amounts of energy and is therefore switched off when the MoveTest is not being used. The blue LED should blink when it is detectable for the PC. If the blue LED is not blinking after flipping the device, most probably the battery should be charged. The MoveTest is successfully coupled to the PC via Bluetooth but MyMcRoberts indicates that Bluetooth connection failed. Make sure that the device is within range for connection with the PC and that the Bluetooth of the MoveTest is turned on (flip the device). What steps do I have to take to couple the MoveTest device to the PC via Bluetooth? Please follow the steps in the MoveTest Manual. Some markers that have been entered during the measurement are missing in the data. The markers are transferred to the PC via Bluetooth after the protocol has been completed. Do not connect the MoveTest via USB connection until notified like in the picture below. Premature establishment of USB connection might lead to failure in tranferring the markers. Send an email to McRoberts if this does not solve the problem. How is the short physical performance battery performed? Click on the following link for the protocol of the SPPB-test. What distance needs to be covered when performing the Gait speed test of the SPPB? The distance of the gait speed test in the SPPB is 4 meters. The participant starts from standstill position. If the FAQ failed to answer your question sufficiently, please let us know.